Get The Power! | Power 2 Present! This is the page for the full Power 2 Present course. Want the free preview? Click here! It’s time to speak up and turn your wisdom, message and expertise into a profit-generating, life-changing foundation for explosive growth in your business and in the world! It’s time to unlock your Power 2 Present! What would it mean to you to be able to successfully use your voice to put big money in your pocket and make a big impact in the world by connecting to the exact people who are desperate to hear what you have to say? It could literally be the key to your personal and professional fulfillment, and see you enjoying financial abundance too! You’ve got this feeling that you have something to offer and it’s churning inside you looking for a way into the world that makes sense, feels right, and results in high value to you and everyone who experiences it. But where do you begin? You keep hearing how amazing you are and how much you help people, but you’re just not making money and still feel unclear about your ‘message’. How do you pick the perfect thing to talk about to reach the most people, return the biggest profit and make the biggest difference in the lives of your clients? Even worse, you still feel icky and slimy about charging for your services or expertise. So which comes first – Chicken or Egg? Get over feeling icky and get clear, or get clear to get over feeling icky? I can tell you, it isn’t that direct and it’s really much simpler! You know the power of being able to speak about your wisdom, training and experience, but don’t quite know how to convert it into powerful presentations that dramatically impact the lives of others and leave them wanting, and paying for more. You have been looking for a new layer to add to your existing business that lets you multiply the number of people you reach and multiply your profits too. You want to move to your next level, break through to success and do it in minimal time and without massive effort. I mean really, who has time for one area of their business development to require a full time effort?! There is a solution! Anything here ring a bell? Well, if it does it’s time to speak up, and I mean that literally. Right now is the time to turn up your voice and tune in to creating impact, freedom, and profit! It’s time to unlock your Power 2 Present! Many of you reading this are friends and colleagues who have known me for years. For you, a hearty welcome back and please know how honored I am that you’ve been with me on the amazing journey that brings us here today! For those of you who haven’t had the chance to partner with me or be in one of my classes yet – WELCOME! I can’t wait to become friends and support you in your success! You see, supporting you in your success is what I do. My name is Terri Hase and I’ve been a professional trainer for nearly 20 years. I’ve been a successful business owner for 15 years and professional coach for almost a decade, (Wow – times flies when you’re having fun!). I’ve had the opportunity to study and practice the power of speaking since my early days in theater, on through my years in professional sales training and most recently, to becoming masterful in the art of Teleconferences, Teleclasses, Public Speaking and Podcasts. I’ve been at the podium or at the mic more times than I can count, but I do know I’ve had the opportunity to take the mic, just as I’m going to support you in doing, in over 500 classes, conferences and presentations. I’ve also had the distinct privilege to have connected with audiences and students in over 20 different countries! I have to tell you, I love it! I started playing small. I was raw, unorganized and untrained. Fast forward – now it doesn’t matter if I’m speaking to 10 or 1,000, I’m at peace, confident and know I’ll be reaching the right people, with the best of what I have to offer and leave them wanting more! Sound good? Sound like something you’d like to know for yourself? Well, believe me, even if we don’t really know each other yet, I know you can! You wouldn’t have the desire if you weren’t capable of living into the call – this I know to be true (Oh Boy, have I got a lot to say about this one aspect and it’s bound to ROCK your world!). Organize your message in 30 minutes or less, in a manner that speaks from the heart. Under 30 minutes, for real! Following a simple-to-use yet totally personal template that guides you through each step of the design. Succeed by doing what feels right and stop trying to do what is ‘supposed to’ work. Leveraging your own strengths, your own style and bringing them to your presentation so it’s simply oozing with YOU! Create attention-getting, action-inviting titles for your presentations. Get out of your head and into your heart. Use the words that touch your ideal audience and get them to make decisions. Take advantage of 5 Secrets top speakers use to keep their audience involved, receptive and alert. The right kinds of interaction at the right time to build trust and intimacy with your audience. Learn 20 key words that are proven sales motivators. Take advantage of the massive research that the big corporations have conducted and make it work for you! Satisfy your audience and leave them wanting more by NOT giving away the farm. Know when to say when and when to go all in. You’ll never wonder if you gave them enough again and will stop wasting time giving them too much! Use story-telling techniques to warm an audience and drive home key points. Stories that provide meaning and ROCK your audience; not stories that are meeting your needs, but not those of your audience…YAWN. Evaluate your effectiveness in the moment so you can make course corrections if necessary. Don’t wait ’till the end of your talk to wonder how you did; be in the moment with your audience. Make the most of your voice. Tone, pitch, pacing, style and more. Use what you’ve got and enhance your use of this valuable asset! Banish nervousness and dump tightly-scripted delivery in 3 easy steps. Fear and misfitting structures will KILL your presentation. Show up confident and totally authentic and able to roll with any distraction. Toot your own horn without a sour note, or sour taste in your mouth! Know your value and be able to speak it cleanly. Get results using the truth and a spirit of giving. Understand the paradoxical relationship between ethics and the power of persuasion. You want to get people to understand the power of your idea or product, but you don’t want to wear them down till they give in. Get and use statistics and research to get your audience excited, not send them nodding off to sleep. Learn how using stats at the right time, for the right reason, makes all the difference. Raise the value and professionalism of your presentation in ways that produce direct bottom line results. Stand up and own the mic, hold the room and be the pro! Use the techniques, tips and templates from Power 2 Present for Teleclasses, Podcasts, Webinars, Live Presentations and more. Tap into all the current hot trends in presentation! Power 2 Present will show you how to modify your presentation to fit MANY models. Walk away with easy to use templates so you can continue saving time and making money for years to come. Templates for content creation, style and tone, integrating activities, masterful follow up emails and so much more… you will hardly believe it! Finally, get the rock solid confidence to: Take the Mic, Speak Up & Present YOU! As my way of saying thank you for joining me and unlocking your Power 2 Present, just for saying ‘YES, I AM READY’ and reserving your seat for Power 2 Present, you’ll immediately have access to 2 additional bonuses and 1 gift absolutely free! Power 2 Present Audio Pro Primer. A step-by-step, graphic and bullet-point approach to sounding like a pro and recording like a pro. Suggested resources, tips and tech advice to make sure you have top quality sounding calls and recordings. The “How to Expand ANY Business Using Teleclasses” Program. Includes the 5×3 marketing plan guaranteed to boost your Teleclass attendance, and Four part Mp3 series with a handy workbook to help you succeed. Also includes special sections on hybrid and specialty calls like: Custom Tele-facilitation for businesses and organizations, Research and Development Teams, Facilitated Discussion Groups and Master Minds – what are they, and when and how to use them all! The world renowned ‘Better YOU Values Assessment’ and downloadable Mp3 ‘Value YOU’ audio presentation. This dynamic values assessment has received requests for usage and praise from individuals, major corporations and Universities alike! Find out what the buzz is all about, and feel clarity and energy from your own relationship with your values like never before! It’s empowering, insightful, challenging and will really bring to light your true values. What you learn here will help you shape your ability to truly present YOU! I am so excited to bring this all together and share it with you! The massive and comprehensive Power 2 Present program, 2 Bonuses and 1 Free Gift – ALL included when you reserve your seat and join me and unlock your Power 2 Present! Now, you might be asking things like, “Terri, How are you going to deliver all this; how are you going to teach me everything I need to succeed when I take the mic? Do I have to fly, drive or stay in a hotel?” These are great questions, and here is your answer: All you have to do is pick up the phone and use your computer! Seriously! Power 2 Present is delivered in six, 90-minute LIVE Teleconferences and three 60-minute LIVE ‘Power Hour’ Teleconferences over the course of 60 days. The 90-minute time slot is easy to schedule and yet allows for in depth learning and growth that can be a bit rushed if we’re trying to crush it into just an hour. The three ‘Power Hour’ Teleconferences are our chance to brainstorm and really dig into your real life experiences. These calls are conversational, fun and designed to give you the first -hand support you need to WIN BIG! Ask me anything and I’ll give you all I’ve got to ensure your success. Unique scheduling allows you to get into action, and process in real time, with all the support and structure I have to offer. We will be meeting for 6 consecutive weeks. You’ll soak up all the great information and then together we’ll apply it, debrief your results, personalize your plan and apply again. Power Hour calls are interspersed to provide maximum support, right when you need it! What’s The Call Schedule? CLICK HERE! MEMBER’S AREA: Not only will you access the full program by LIVE Teleconference calls, but you will also have access to each session after their conclusion, via easy to download Mp3’s. Keep these for refreshing your learning and on-the-spot support for years to come. Super handy for catching-up if you miss one of the live calls! Friendly and actually service oriented Client Support! Available by email and phone to help you make the most of your experience and help you to be, well, really supported! Power 2 Present – my step by step, comprehensive program conveniently delivered via Teleconference -That’s 9 hours of LIVE, interactive training PLUS 3 hours of in depth Power Hour access! A beautiful Power 2 Present workbook with pages and pages of value at your fingertips. Numerous templates to use and reuse to continue saving time and making money when you take the mic. Including the 30-Minute Content Design System, Top Speaker Secrets, Words that Sell and more. Full audio of your Power 2 Present program as a valuable addition to your long term success library. Knowledgeable and friendly client support to ensure you a top quality experience. The Member’s Area – Log-in to access all your bonuses and review the sessions, or catch-up on a missed call! 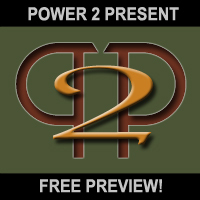 BONUS – Power 2 Present Audio Pro Primer. BONUS – How to Expand ANY Business Using Teleclasses Blueprint and Mentor Program. FREE Gift – The Better You Values Assessment and Value YOU audio. The price and the guarantee, of course! I could go on for some time breaking down how reasonable the price is, and the priceless value of each nugget, template and hour; I could detail for you how applying the principles and strategies you’re going to learn in Power 2 Present will most likely double or triple your return on investment in your very first presentation; I could tell you that the price, only $497.00 US, is less than you’ll likely spend on cable TV service before the end of the year – and I KNOW it’s less than you’ll spend on gasoline this summer; but I think you’ve already got the idea! What I am going to say is this: If you have been touched, inspired, intrigued or challenged by anything I’ve shared and offered here, I’m asking you to invest $497.00 US in yourself and join me for Power 2 Present. I KNOW you’re worth that investment and much more. I KNOW I’ll over deliver WAY more value, for sure! I believe you won’t regret it for a minute, won’t stop using it for years to come and will shine every time you take the mic and unlock your Power 2 Present. In fact, I believe it’s one of the lowest risk investments around… well, I also know there is actually no risk at all! That’s because I offer a 100%, no questions asked, money back guarantee. If you don’t feel Power 2 Present is a good fit for you, for any reason, simply let me know and my staff will promptly process your refund (Our policies are detailed here). So, are you ready to take the mic, speak up and present YOU in totally authentic, new, creative, powerful and profitable ways? Reserve Your Seat Now (two ways to pay)! I can’t wait to share with you all the Power 2 Present has to offer! PS:I’ve shared a lot here and I believe I have given you everything you need to make a good decision. I’m confident in the benefit and transformation this will make in your professional AND personal life. I hope you choose to invest in yourself, your success and fulfillment by joining me for Power 2 Present! If you have ANY questions or concerns, Click Here for help!